003: Hipsters Are the New [insert blank] | The Nerdette's Guide. ← #002: Fandom & ‘Shipping. I was not one of the cute highly-pop-culturally-literate-but-socially-stunted kids in high school. I did not hang out with my BFF Seth Cohen, wear my skinny jeans and look down on anyone who listened to something in the top 40s. That really just wasn’t the case. Sure, I was highly pop culturally literate and kind of socially stunted, but I was more of a Taylor Townsend than a Seth Cohen. However if you were to talk to my seventeen-year-old self, I would stare at you like you were speaking Japanese and had worms for hair. 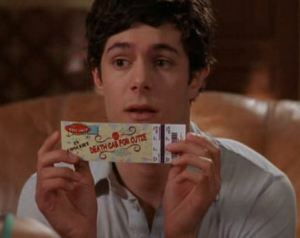 This isn’t to say that I was a teenager before The O.C. graced the airwaves and that the reference wouldn’t yet exist. No, during the time that The O.C. was on the air I was in their target demographic: all bright-eyed and bushy-tailed and hoping that someday I could meet an eighteen-year-old boy who looked like he was twenty-seven. I justd didn’t start watching that show until college, when it was in its third season and already starting to stink up the place. My high school years were cool, trendy nerd free. I knew the cool, trendy kids and I knew the nerds and I knew that the two were never going to be one and the same. Or so I thought. Apparently while living out the John Hughes fantasy that was my adolescence (except you know, most of the stuff that would make it a fantasy were decidedly lacking) I didn’t get the memo that nerds were going to be in. If I had, I would have found a way to make money on it. None of my high school friends were like this guy. None of them. Where was I? Oh yes. So in high school, like the majority of people who have lived through it, I had my interests and my teenaged holier-than-thou attitude down to a science. There just wasn’t any label for it. I established my style and my tastes and while they were somewhat informed by magazines and the rock stars I loved, they were just as informed by whatever was on sale at Target. Or whatever I brought home from the second-hand shop that wasn’t immediately donated again by my mother. I didn’t wear skinny jeans or a lot of black and I didn’t really have a set style besides being something of a preppy punk 80s throwback for much of my senior year. Fast-forward to college where suddenly people found the tee-shirts with sayings that I had made myself to be things like “fun” and “edgy” unlike what they had been during high school (“weird” and “interesting”). Suddenly my strangeness had an audience. There were other people who enjoyed the same mix of independent singer-songwriter and full band music that I loved with a bit of a 60s and 70s flare. It was a great time for me that just happened to coincide with the birth of the hipster. Ugh. I hate that word. I know that by saying that I am not a hipster I am merely proving the fact that I am. So I will just own it. I have a massive record collection. I love used bookstores. I am deeply enthralled with this retro dress I got for $5. I love causes and getting really indignant about strange things. I am a quintessential hipster except for one small fact: I’ve been like this since I was about seven except back then I wore a lot more flannel. I drink PBR (I went to college in Wisconsin — it was all but mandatory). I don’t drink it willingly or by choice, merely gravitating towards it because it is better than say, Milwaukee’s Best or Keystone Light and if I am going to get hammered from playing flip-cup I want my cheap beer to be at least semi-enjoyable. I know the lingo, I know what to read and how to say and when to roll my eyes. If there is a script, I’ve got it tattooed on my arm (except for the part where I don’t have any tattoos, meaningful or otherwise). I like the top 40s. I may not actively seek them out, but I will be damned if the likes of Katy Perry and Lady Gaga did not make a catchy tune that sticks to my brain like I’ve used Gorilla Glue. What I am trying to say is that not all of us who like these things or go to those concerts or wear those clothes are unbearable hipsters. We can be, but we also can know all the rules of hockey and enjoy Family Guy. I may hate the label, hate the fact that some people take things way too seriously and tend to look down upon those who stop by to see what’s happening. It’s not bad to share the things you like. It’s good. If more people like what you like, the chances are higher that what you like will stay available. It’s really hard to see a band in concert, if lack of interest has caused them to go to work in the food industry. So be kind to the visitors to your neck of the realm. And remember: there is a large chance that that thing you love and no one else understands quite the way you do, was first loved by someone else. That’s just how the world works. But don’t worry: sometimes I roll my eyes as well. Like I said: I can be an unbearable hipster. I think being hip is better than being part of the herd. And as an artist trying to make an independent life, I hope there are enough hipsters out there who will like what I’m doing. Like you, I was a, “highly-pop-culturally-literate-but-socially-stunted kid”. Now I’m in my 20’s, trying to make it as an Indie Graphic Novelist, it often feels like I’m the only hipster in the city. My first graphic novel, ‘Hippy Jonny’ has attracted the attention of a UK publisher with distribution in the US. While I’m finishing it, I’m hoping my website will get more hipsters like you. You’re right, being hip is somewhat better than being part of the herd, but it’s important remember that that just makes you part of a different herd. Not that there’s anything wrong with that. We need groups to survive or least maintain something resembling sanity. Thanks for letting me know! I also write for a blog called Girls Read Comics, so I’m always on the search for new graphic novels and comics to read and then yammer about to the masses. I will definitely be checking that out and by the way, congrats on the publishing deal. You’re so right about needing groups to survive. That’s why its so important to get the support of like minded people. I’m working everyday to meet my Publishers deadline, this summer. . When it’s published I’ll be sure to let you know. I’m Half American myself btw, so its important for me to help develop an American Fan base, as I would eventually like to relocate State-side. I am now telling all my twitter and Facebook contacts about your Girls Read Comics Too site. In fact, I’ve read this week on the British comic review site, Bleeding Cool, that your site might be up for an award? Just a line to let you know my graphic novel Hippy Jonny will be published 31st July, it is being launched at the San Diego Comic Con, July 21-24st. Lots of interest in reviewing it already, including USA TODAY. Very much hope you are still interested in reviewing Hippy Jonny? Can arrange for my publisher to send you a PDF. Hope you are well.